Just in case the four gazillion tracks available for download aren't enough for you, Harmonix is up to something that will bring even more tunes your way. MTV is launching the Rock Band Network later this year. The network is a way for any artist to upload their songs so they can be enjoyed in video game form. How about some details? Rather than deal with Harmonix directly, artists and labels will submit songs to a community of Harmonix-trained freelance game developers and other interested programmers who will prepare the tracks for "Rock Band." Songs submitted through this process must then be reviewed by other developers to check for playability, inappropriate lyrics, copyright infringement and so on. Harmonix will post approved tracks to an in-game download store separate from its existing "Rock Band" store where creators can set their own price (50 cents to $3 per song) and receive 30% of any resulting sales. This is some big news, for sure. Rock Band has always been very pro-DLC, and now that position is strengthened even further. I'm certain artists everywhere, from unknown to world class, are eager to get their music into Rock Band. 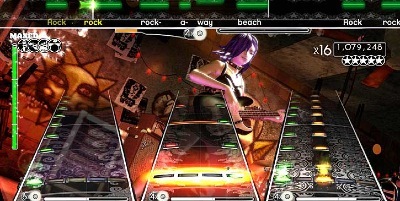 Initially, the Rock Band Network will only be available on Xbox 360, but popular songs may find their way onto your PS3 or Wii eventually. What are your thoughts on the Rock Band Network? What artists are you hoping will use the service? Page created in 0.6639 seconds.